Enjoy this Adventure: Relax, Enjoy and let it go. Bilingual guides. National open bar on the Catamaran. Tour snorkeling on the reef called El Farito or visit the muse. Flight in Spinnaker (if the weather conditions permits). Isla Mujeres is located in front of Cancun, it is a small island full of marine fauna and wonderful beaches. Isla Mujeres receives that name due to the goddess Ixchel, Mayan goddess of the moon, love and fertility. The Mayan natives brought offerings of feminine forms to the island, centuries later when the Spaniards stepped on these lands for the first time and saw these offerings, they named it Isla de las Mujeres. In this wonderful island there is free time to enjoy Playa Norte, in this majestic beach you can distinguish well the turquoise tones of the sea, since this beach has no algae or any other dirt. 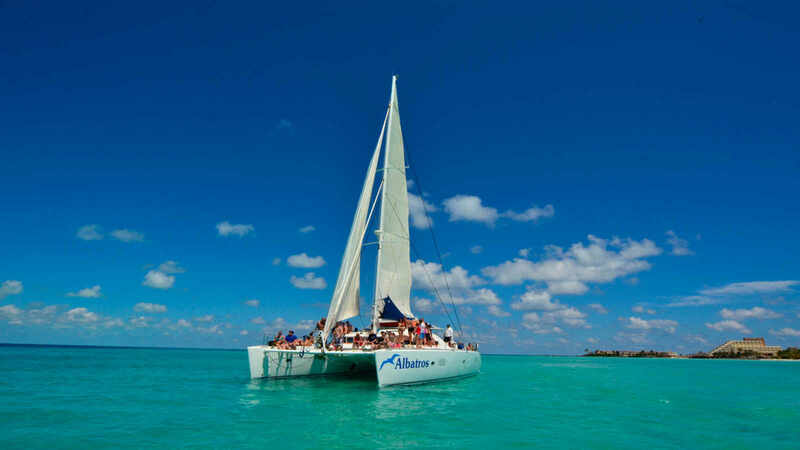 An excellent option to visit Isla Mujeres is in Catamaran. What is done in this activity? Apart from boarding a catamaran, Snorkel will be performed on the El Farito reef. Enjoy the national free bar included. Swimming in the reef el farito is an incredible event, the recommendation is always to do it with an instructor since this ecosystem is very special. Upon arrival in Isla Mujeres you will have free time in the center, here you will learn a lot about the Mexican culture and how they live thanks to tourism and fishing. You will find handicrafts that can be bought and take a nice Mexican detail. You can also choose to enjoy Playa Norte, considered one of the most beautiful beaches in Mexico.Enjoy an amazing adventure from Cancun to Isla Mujeres on aboard a catamaran. A super choice for fun with your best friends and lovers at the Caribbean Sea. Our crew will ensure that you have the best experience. Includes free national drinks loaded with lot of fun and good times bar, an incredible snorkeling tour, a delicious buffet lunch to recharge batteries and better flight in Spinnaker. We take care of marine life, that is why we ask you to bring biodegradable sunscreen. Bring sunglasses, swimwear, sandals, hat, towel and a change of extra clothes. CHILDREN FROM 4 TO 10 YEARS OLD PAY LOWER PRICE (MORE MARINE TAX). $ 58.00 Juniors 5 - 10 Years.